If you sew, chances are that fabric scraps abound in your sewing area. Don’t worry about storing scraps; sew them! Use Nancy’s Change-Up Patchwork techniques to create quilt projects with contemporary designs. Watch the second episode of Change-up Patchwork online to see all the details! This scrappy square design was made from leftover fabric. Team Nancy auditioned what was stored away. Then, we turned coordinating fabrics into an ideal kids’ quilt. Learn how to stitch the square within a square design, using simple strip piecing techniques. Watch online to see how it’s done! Assemble square within a square blocks with large centers. Cut 4-1/2″ crosswise strips for the centers and 1/1-2″ crosswise strips for the sides. The blocks are 6-1/2″. Then, create again as many 6-1/2″ squares with small centers. All strips are cut 2-1/2″ wide for this easy block. The layout is simple—alternate the blocks! Now it’s time for artistic expression. The Scattered Squares Table Runner features four different block configurations that are mixed and matched to create a conversation piece. Watch online or read in the book how to design your own square within a square block with the use of “old school” graph paper. Deciding on the arrangement took the most time! Designing quilt blocks is as much fun as sewing them—Nancy called this design, Flip Flopped Rectangles. Replace a square with a rectangle to create a modern look. The skill set is the same, but the strip sizes have changed. the other half of the blocks have a horizontal contrast. Find these easy 4-patch quilts, and six additional quilts, in the new Change-Up Patchwork Book and DVD or in the Change-Up Patchwork Starter Set. Watch Change-Up Patchwork Part Two and Part One on Sewing With Nancy online. 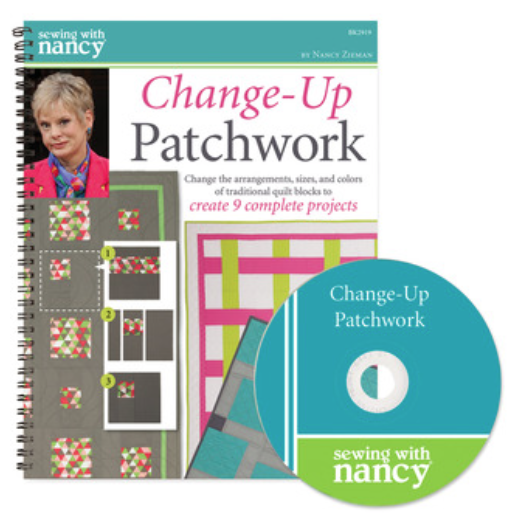 Nancy’s Notions is giving away one copy of the book/DVD, Change-Up Patchwork. Leave a comment below to enter the giveaway, telling us which of these designs you’d like to make. The randomly selected winner of a copy of the Change-Up Patchwork book and DVD from the July 5 post is Lona Nordgren. Her comment is: I would love to try all the patterns. We have a group from our Church that make many quilts for charity. The patterns from this book would make beautiful quilts for our group to make. This would be perfect for my family gift quilts. I have several quilts I need to make and this is the perfect tool to make the mission accomplished. I have a lot of gift quilts to create. I look forward to using this innovative twist. I like the scattered squares. I would like to make the scattered squares and flip-flopped rectangles quilts! I love geometric patterns. These projects look easy enough for a beginner but give the impression of an experienced quilter. I think the 4-H kids that I teach to quilt would love to try some of these patterns. Not being a quilter these quilt projects look like something I could master and would love to try. The flip flop rectangles look interesting to me. I would like to make a two color quilt. I would love to make the flip flopped quilt. It will give me a chance to use up some black and red quilt materials. Love the Scattered Squares Table Runner! Thanks for the great giveaway. I would like to try the Scattered Squares quilt, as I’ve been interested in trying the minimalist look. I am part of a group in my church where we make quilts, etc., to donate to area agencies for the needy. We need to make more things for gentlemen, and Scattered Squares can easily be made to look masculine. Such great ideas for using up some of my scraps and stash! I like the flip-flopped rectangle quilt. I would love trying out different colors of fabric! I like the scrappy square quilt pattern. It’s just so happy! I absolutely love the scrappy square in a square quilt. The offset square in a square is cool also! Great thought producing blocks. Teaches me how to make my own design. Thanks. I like the scrappy squares quilt. I would like to use some of my fabric scraps. I would love to try to make the Scrappy Square Quilt!! I have plenty of scraps in my stash to use! I like the scrappy squares. What a great I Spy quilt it would make! I love the Scrappy Squares. I know look at blocks in a completely different way. Such great quilts! Flip Flopped Rectangles Quilt has my vote for its clean nice clean lines and the stunning visual impact that it makes. Scattered squares would be my choice. Totally the scrappy squares!!! Such a fun use of smaller bits and bobs! Scattered squares would be my selection because of it’s simplicity. Such a simple change for really dynamic change. I can see all children loving this design. Our niece with special needs will definitely appreciate this. I love the scrappy squares quilt. It looks easy enough for my limited experience in quilt making. I have lots of florals that would be fun to see them used in a quilt. I love the flip flop rectangles quilt. Thanks to the great pattern designer, it is simple to piece, yet looks very graphic. I like the flip flop rectangle quilt. Looks like a great baby quilt. Could very easily add embroidery as well. The Scrappy Quilt would be good to use up my scraps. Thanks for the chance to win. I would make the square in a square as a baby quilt for my grandson and I would use cars and trucks etc for the center square. Good luck everyone. Thank you for the chance to win. The scrappy square would make a fun baby quilt. Thanks for all of the inspiration–my first choice would be the flip flopped rectangles. Scattered Squares would be my first choice. Thank you for the chance to win a copy of this book. We want to make all of them. My granddaughter is learning to sew, and she loves to do these types of blocks. I could make flip flop rectangles from my scrap fabric. Wow! These look so easy but have a special calling. I think my grandkids and greats could even do them or at least enjoy them if Gme made them. Would love to be the winner of this but will look for the book when my friend and I go to fabric store today. I love the scattered squares. I think they would look great in a scrappy quilt. Such great ideas to use up scraps. These are wonderfully colorful blocks that would make anyone happy. I love that they are uncomplicated to make but provide such beauty. Oh my heck! I LOVE them all! They all look so FUN and appear to be quick and easy! I really like all the quilts show. It is a great way to use up scraps. I like the one on the book cover which looks like “woven” strips! A square in a square would be my choice. I love all of these. First one I would make is the Scrappy Squares so I could use up some of my impressive scrap collection. The scattered squares would be the first on my list. Flip flopped the second on the list. Just love these quick and easy quilts. Would love to win the book. I love the Scattered squares! I have lots of colorful prints to include in that design. Thank you again for the opportunity to continue learning and for making older patterns new again! Probably a square in a square. The flip-flopped rectangles quilt looks modern and fresh. I would like to try that one with white and possibly teal. Thank you for the chance to win this prize. I love all the quilts, but the one that is really calling me, is the Flip Flopped Rectangles. I love the look of rectangles, and the fact that it is not a traditional square. Scrap quilts are my favorite. I would like to make the flip flop rectangle quilt using scrappy fabrics, similar to the scrappy square quilt. I am hopeful that Team Nancy will continue to make informative quilting, sewing and crafting videos as Nancy did for so many years. I love the quilts! They are a great way to use up scraps and they look really classy. Looks like so much fun. Would love to win the prize so I have plans. I love the look of the scrappy square quilt. It’s easy enough for the beginners that I teach and sophisticated enough for teenagers! I have been saving my scrapes for a project like this. So many possibilities. Flip flopped is calling my name! i would like to start with the scrappy one. I belong to a quilt group and we use donated fabrics to make quilts and other items for local charities. We have bins of scraps, what a great way to use them up. With many years of sewing and saving scraps, I’m sure I have plenty of scraps for several scrappy Square quilts. Time to get started!!!! I love the look of the scrappy quilt. I looks like so much fun.